FILE - U.S. Air Force General John Hyten testifies in a Senate Armed Services Committee hearing on Capitol Hill in Washington, April 4, 2017. U.S. President Donald Trump appears increasingly willing to defy some of his top generals, as his administration grapples with how best to deal with Iran. Trump is facing a May deadline to recertify the Iran nuclear deal, and signaled again Tuesday that he is not afraid to pull the U.S. out of the agreement unless other signatories are willing to make major changes. 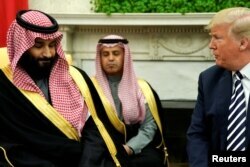 "A lot of bad things are happening in Iran," the president said during a visit to the White House by Saudi Arabia's Crown Prince Mohammed bin Salman. "The deal is coming up in one month, and you will see what happens," he added. U.S. President Donald Trump delivers remarks as he welcomes Saudi Arabia's Crown Prince Mohammed bin Salman in the Oval Office at the White House in Washington, March 20, 2018. Trump has long been critical of the 2015 Iran deal, also known as the Joint Comprehensive Plan of Action, which aimed to contain Tehran's nuclear program and block the country's pathway to building nuclear warheads. In January, Trump said he was waiving nuclear sanctions against Iran for the "last time," demanding U.S. lawmakers and Washington's European allies "fix the deal's disastrous flaws." But since then, top U.S. military officials have pushed back, repeatedly describing the deal as mostly beneficial, even as they continue to voice deep concerns about Tehran's aggressive behavior across the Middle East. "As I sit here today, Iran is in compliance with JCPOA [Joint Comprehensive Plan of Action]," the commander of U.S. Strategic Command, General John Hyten, told lawmakers on the Senate Armed Services Committee on Tuesday. "From a command that's about nuclear [threats], that's an important piece to me," he said. "It allows me to understand the nuclear environment better." Hyten's comments follow those made to the Senate Armed Services Committee last week by the commander of U.S. Central Command, which is responsible for U.S. operations in the Middle East. "The JCPOA addresses one of the principle threats that we deal with from Iran so, if the JCPOA goes away, then we will have to have another way to deal with their nuclear weapons program," said CENTCOM's General Joseph Votel. 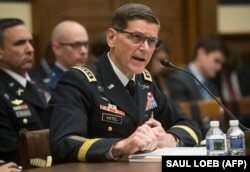 FILE - U.S. Army General Joseph Votel, commander of the U.S. Central Command, testifies during a House Armed Services Committee hearing on Capitol Hill in Washington, Feb. 27, 2018. "Right now, I think it is in our interest," Votel added. "There would be some concern [in the region], I think, about how we intended to address that particular threat if it was not being addressed through the JCPOA." Both Defense Secretary Jim Mattis and Chairman of the Joint Chiefs of Staff, General Joseph Dunford, have argued that staying in the deal is in the best interest of the U.S. But despite having expressed confidence in his military advisers and officials early in his presidency, Trump has slowly been pushing aside those who have argued in favor of keeping the deal, most recently firing Secretary of State Rex Tillerson. "When you look at the Iran deal, I think it's terrible. I guess he thinks it was OK," Trump told reporters last week after announcing Tillerson's removal. "I wanted to break it or do something, and he felt a little bit differently." The man tapped to replace Tillerson, current U.S. Central Intelligence Agency Director Mike Pompeo, has gained a reputation for favoring a much tougher approach to Iran. 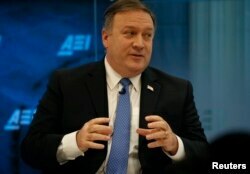 FILE - CIA Director Mike Pompeo speaks at a forum in Washington, Jan. 23, 2018. "The deal put us in a marginally better place, with respect to inspection, but the Iranians have on multiple occasions been capable of presenting a continued threat," Pompeo said during an appearance in Washington last October. "The notion that the entry into the JCPOA would curtail Iranian adventurism or their terror threat or their malignant behavior has now, what, two years on, proven to be fundamentally false," he added. Those concerns, both from the U.S. intelligence community and from defense officials, have only grown. Top defense officials have criticized Iran for what they described as malign and destabilizing activities in places such as Iraq, Syria, Yemen and even Afghanistan. "They [Iran] are not changing their behavior," Mattis warned during a visit to the region last week. "They're continuing to be a destabilizing influence." Other defense officials said such concerns cannot be discounted when contemplating U.S. policy toward Iran. "We are taking a comprehensive look," chief Pentagon spokesperson Dana White told reporters last Thursday. "We remain in the agreement, but we want our partners to understand that Iran is the source of chaos and confusion in the region," she said. "Everywhere you look, Iran is there."